This truly amazing decorative letter came from Wolfidy, who actually APOLOGIZED for not having cool stationery - whereas I think the home-made original doodles are better than any printed product! Wow. 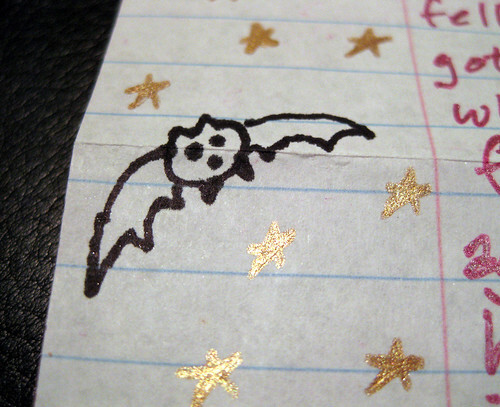 I held this under the light just admiring the metallic gel pen ink for quite a while. and a bat doodle which I love. Hooray for snail mail! This letter, of course, made my day. Yeah, who needs the fancy stuff when you have THIS?? Go Wolfidy! OMG! Just got your return letter, but am totally flabbergasted to make my return to the internet and see you posted the whole letter! :D Thanks for the link back! I promise you more doodles to come! 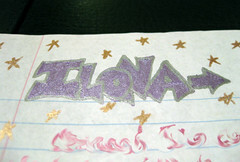 I used to get in trouble (or get extra credit, depending) in school for drawing all over everything. 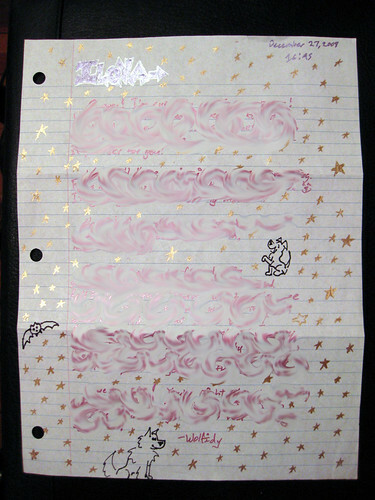 I'm pretty sure I used Gelly Roll Stardust pens on that one...they're my favorite. I know you're more of a fountain pen kind of girl, but thought you might want to know. I do generally use fountain pens, but every now and then I want to write a letter on black paper, or address a black envelope, and then the Gelly Roll metallics are my pens of choice. I do kinda miss them sometimes - maybe I'll write a letter on black soon.